My winter hack bike was in serious need of some mudguards, now that winter is closing in fast. Getting soaked in a brown sludge of road grit is no fun! The problem I encountered was that most mudguards won't fit on the back because of the oversize cyclocross tyres I have fitted. So I set about making my own guard from some old inner tubes! There's no specific measurements in this instructable, because everyone's bike will be different. The wire 2mm I used was only just strong enough for this so I'd use 2.5mm or even 3mm wire if I made these again. The front guard is perfect but the back one rattles a little. I've entered this into the inner tube reuse contest so don't forget to have a look at all of the entries and vote for your favourite ones, when the time comes. Step 1: Cut Your Inner Tube to Size. Decide on the length you want the guards to be by lining a piece of inner tube along side the wheel, do the front and back, but but the back guard away for now. We'll just work on the front mudguard first. Measure the distance between fork eyelets and the edge of the mudguard. Add this to the length of the piece of inner tube you cut. Double this and add a foot spare for mistakes/clearances etc. Cut a piece of the steel wire to this length and bend a U shape in the centre about the same width as your inner tube. This will be the beginning of the skeleton of the mudguard. To attach the guards to the bike, I made a simple metal bracket. I made this out of a scrap VCR base. To mark it out just draw a rectangle that's as wide as the metal U shape you made in the previous step. Then draw 3 tabs around it, two to fold over and secure the wire U and one to attach to the bike. The tabs that fold over the wire are secured with some little eyelets, rivets would be stronger but I didn't have any. Before you cut it out, drill all the holes, the hole sizes will depend on the mounting bolt and the size of the eyelets/rivets that you're using. You can clean the edges of the holes using a Dremel or a file. Cut the shape out and fold the tabs over the wire U shape. Hammer them flat, to secure the wire. Next, drill all the way through the eyelet holes and crimp the eyelets in place, to help secure the metal tabs closed. A problem I've had with mudguards in the past is that you shoe can hit the mudguard when turning slowly(or worse still, when you're attempting a trackstand). This can bend your mudguards, so I made the rigid part of these guards stop above where my shoe might hit it. 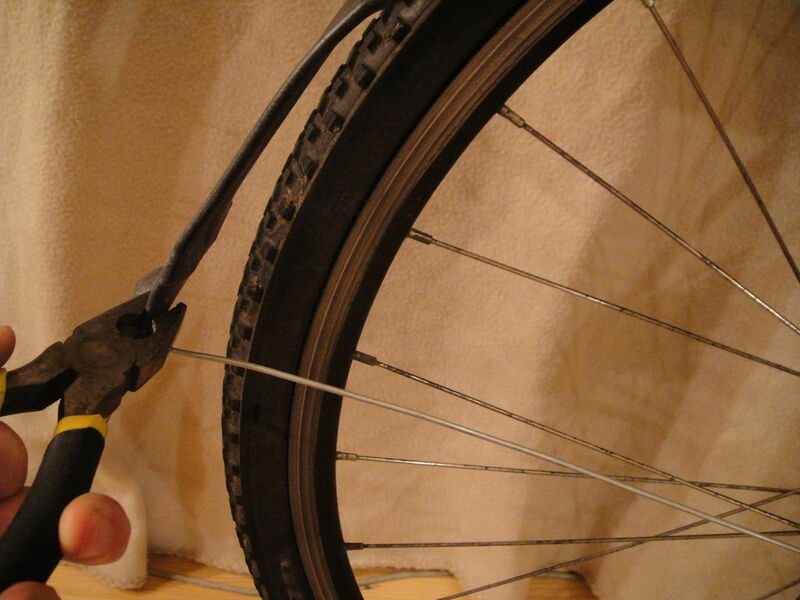 Balance the wires on the tyre, if you use SPD's or similar clip your show in. Mark on the wires just above your show. To keep the mudguards flat profile, there are cross pieces separating the two steel wires. The rest in V slots so that they can't slide along the wire. The first V slot was a big one, not for a cross piece, but to keep the sheet metal piece in place should it ever come loose. The rest of the V slots were made at 10cm intervals from the sheet metal up until the shoe mark. When you've made these you can wrap as tight as you can between each of the V slots. After they're all in place, mix up some epoxy and apply it to the where the cross pieces are wrapped over the V slots. This stops them moving along the wires and stops any rattling. Step 5: The Mudflap and Eyelets. Below the where I marked the shoe level there will be a mud flap, I lined the inner tube up with the end of the sheet metal. Mark two holes for the eyelets in line with the shoe mark. About an inch away from this, mark a line right across the tube. Cut down the sides of the tube up until this line, and cut across the line, this will remove one half of the tube around the mud flap. This is so you can get the tools in for the eyelets. Punch two holes using a leather through punch or similar through one side of the tube. You can install the eyelet now. It's quite awkward to get the eyelet tool in place, but possible! You can slide the inner tube over it's skeleton now, it's important that you thread the ends of the wires through the eyelets. As you slide the inner tube along, the tension from it will probably deform the skeleton a little, don't worry about this, you can straighten it out later. Once the inner tube is fitted all the way along, you can bend the wire to a right angle where it leaves the eyelets. This is to point the wire toward the the forks. You should be able to fit the mud guard now, bolt the sheet metal piece to the brakes. All that's left to do, is form a loop on the ends of the wires that go to the forks. I made it so that it could be moved left and right to adjust the position of the mud guard. You should have a washers to spread the load a little, I didn't have an suitable washers in my junk box, but I'll be buying some ASAP. That's the front mudguard done! The first time you ride it might rub a little, just keep making adjustments until it's silent! Because there's absolutely no clearance under the brakes on my bike, I had to go over them. The sheet metal bracket it made in the same way as the front except that it has a long strip attachment, so that it can bend over the brakes and to the brake bolt. The skeleton for the rear guard is made in exactly the same way as the front guard, except that it has more cross pieces. There's no shoe mark to work from though, just use where ever you want the mudguard to end. The eyelets on the rear mudguard are right at the end of the tube. I didn't add a mud flap because I thought that it would just hit the wheel. You can now slide the inner tube onto the skeleton as you did with the front guard. Step 11: Attaching the Mudguard. Bend the strap over the brakes and bolt it in place. Then take the free ends of the wire and form hoops for the bolts to hold them down, as you did for the front guard. You might have to bend the wires outward a little if they are too close to the tyres. As it was, the mudguard wasn't strong enough to be used, so I added an extra sport about half way around the wheel. I wrapped it around the mudguard and down to the other eyelets. For a hoop on the free ends to bolt them to the frame. Add washers and tighten everything up. It's finished now! That is such a cool idea!! Awesome job!! I was going to make something for the contest, but my idea didn't pan out. I think I will vote for yours on the contest though, since my bike will probably be fitted with these within the next week or so. Awesome use of old tubes. I wonder if instead of the tube, and old tire would work since it has some structure to it already with the wires. Its about the right radius for the tire as well.